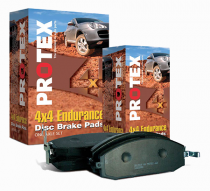 Designed and manufactured with the goal of meeting the challenge of effectively stopping 4WD vehicles, Protex 4WD brake pads are a certainty. Extensive testing in all conditions and the harshest terrains has produced only positive results. Innovative technology specifically matches each vehicle to its most compatible friction material, ensuring reliable braking performance. Is Protex 4x4 Endurance the Right choice for your car?